Steve Mc Queen at the ISDT. Click the image to see video of some classic Trophy action. Why would anyone take a perfectly good 1969 Triumph T100 S and make it into a dirt bike? Yes, that question has also been challenging my sanity lately, but that’s just what I am doing. 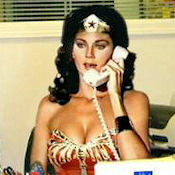 But first I’ll present the case for my defence. Firstly the donor T100 in this case was not as pristine as the one in the photo in the gallery below, it was in fact cosmetically tatty and needed a tidy up anyway. That’s my only rational excuse, the real reason is less defensible. In my youth I was brought up on a diet of English motorcycle magazines and all through the 1960s I was fed copies third hand from a friend of my father. The stuff that really interested me was the scrambles and trials, and trials in those days were not only the feet up stuff, but also included the multi day speed events like the ISDT (ISDE) that we now call enduros. My heroes therefore were the like of Jeff Smith, Arthur Browing, Sammy Miller and in the long distance stuff, Ken Heanes, John Giles and Roy Peplow. 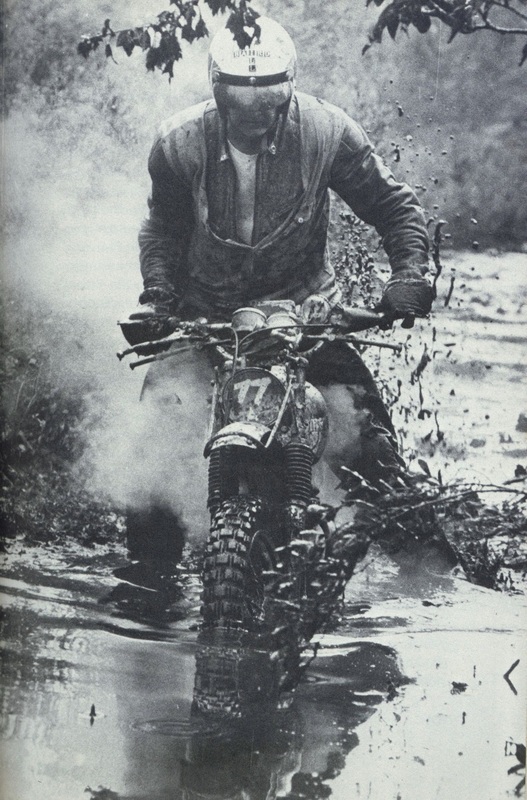 Then of course came film actor Steve Mc Queen, a Hollywood star who to add icing to any boy's dream was no show pony, this man really raced dirt bikes and was actually bloody good at it. My heros rode Triumphs, real mens bikes with a proper exhaust note and with amazing success, in events like the Welsh Two and Three Day and International Six Days Trials (enduros). Their machines were most often unit 500cc Triumph twins, descendents of the most famous off road winning Triumphs, the rigid-framed pre-unit 500cc TR5s that won the World Trophy in the I.S.D.T several times in the late 40s and early 50s in the hands of Bert Gaymer, Jim Alves et al. That re-born Triumph can now name an unashamed road bike the ‘Trophy’ beggars my belief, but that’s another story. Triumph;s success off road went a lot further than Europe. During the 50s and 60s Triumph 500cc and 650cc Trophy models were the dominant force in USA enduros, desert races and flat track racing. 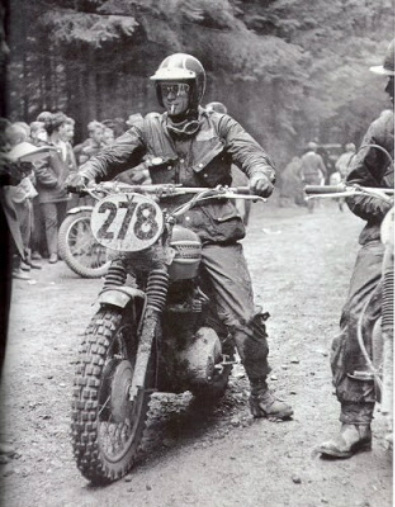 Bill Baird won the East Coast Enduro championships many times on a 500, while in the wide-open spaces of California the likes of Bud Ekins (and his mega-famous actor mate Steve McQueen) cut apart giant 1000 rider fields in the deserts. 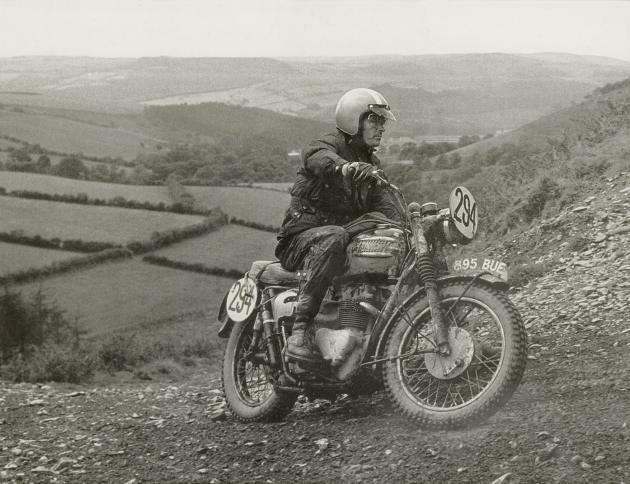 Ekins was to cross the Atlantic many times to ride Triumphs in the ISDT and was the man who inspired Steve Mc Queen to do the same. In the USA Triumph Trophy models sold by the ship load. Triumph attempted to revive the Trophy's enduro fortunes again in 1973 when the factory entered a team in ISDT, that year held in Dalton on the East Coast of the USA. These were the new 500cc Adventurer models, essentially Triumph Trophy engines fitted into BSA off road frames. Though the team rode with great success, the effort was in vain, for Triumph, along with the rest of the British Motorcycle industry were in severe decline, blighted by stand-offs between out of touch managers and militant unions. In the end they all lost their jobs. But that too is another story and with a little time and spare cash in my piggy bank I thought it would be fun to build up a sort-of late 60s Triumph ISDT replica. A replica it would have to be becuase there was virtually no chance that I could ever find a genuine ISDT Triumph. Those bikes that remain are now highly prized and it must be remembered that Triumph were far better at promoting their factory riders success than actually producing replicas that the public could buy. Though Triumph did produce a full replica production TR5 Trophy in the late 40s and early 50s succesive Trophy models became less off road oriented so that by the late 60s differences between the Trophy and the road models were minimal. My concept then, would be to attempt to build a bike strongly reminiscent at least, of the works machines. This would be no concours stickler, rather a practical machine (as much as an old Triumph can be) to ride on and off road, to such an extent that it might be a good enough adventure bike to tackle an event or two each year without crippling this aging rider. Like all good projects this one has had a mighty long gestation, over 20 years in this case, but it is finally underway in earnest. British Spares from Motueka gave the impetus needed with the sourcing of a wide-ratio gearbox cluster and many other detail parts to make the conversion work. Over the next few months I will cover the modifications I am making to the engine, frame and cycle parts and show how the ISDT Triumph is coming together, and in time what it is like to ride. USA Enduro Champion Bill Baird in action on a Triumph Trophy complete with early pre health and safety bush bars. Click the pic for classic Triumph off road video action. 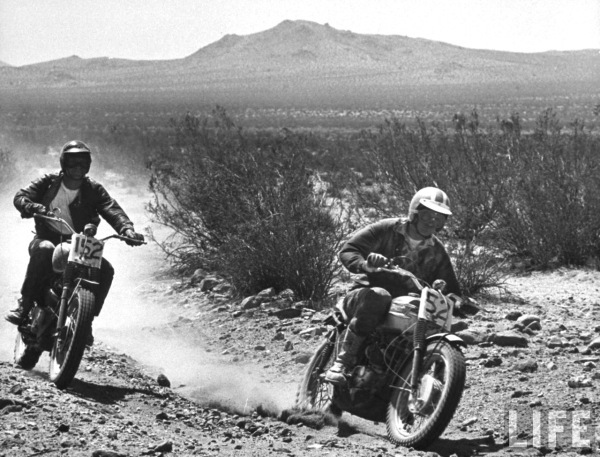 Legendary Californian enduro rider Bud Ekins #52 leads his mate Steve Mc Queen in this shot from the 1963 Greenhorn Enduro. Ekins is wearing his 1962 ISDT helmet seen in the shot below. Bobby Foxworth, lifelong friend of Ekins and Mc Queen correctly identified the riders and knows the bikes as he restored the T120 that Mc Queen is riding. Bud Ekins again but this time scrambling the Triumph 650 in his native Southern California. British Spares are waiting to take your orders. Click the chick to go to their website.